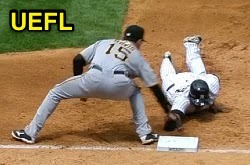 Instant Replay Review overturned 1B Umpire Marcus Pattillo's safe call in the bottom of the 4th inning of the Pirates-Yankees game. With two out and one on, Pirates pitcher Charlie Morton threw to first baseman Ike Davis in an attempt to pick off Yankees baserunner R1 Zoilo Almonte. Upon Replay Review as the result of a challenge by Pirates Manager Clint Hurdle, Pattillo's ruling was reversed, the call was incorrect. At the time of the review, the Yankees were leading, 4-1. The Yankees ultimately won the contest, 4-3. This is Marcus Pattillo (18)'s sixth Replay Review of the 2014 MLB Regular Season. This is Crew Chief Bob Davidson's 12th supervised Replay Review of the 2014 season. This is the 300th Instant Replay Review of the 2014 MLB Regular Season. This is Pirates Manager Clint Hurdle's 14th Replay Review of 2014. Umpires are now 156/300 (.520 Affirmation Rate) in Replay Reviews during the 2014 MLB season.